Coffalyser.Net allows you to select several zoom options for peak profiles, electropherograms and ratio charts. Manual zoom: You can manually zoom in by dragging a rectangle. Auto: The default zoom level. Zoom all peaks: Zoom in on all size-called signals, including (nonspecific) signals. Zoom all fragments: Zoom in on all identified MLPA control fragments and probes. Zoom probes: Zoom in on just the MLPA probes (not the control fragments). You can zoom out one step by double-clicking in the charts. You can also right-click and select Reset Zoom, or use the keyboard shortcut Ctrl + R. To return to the original view, right-click and choose Zoom method > Auto. 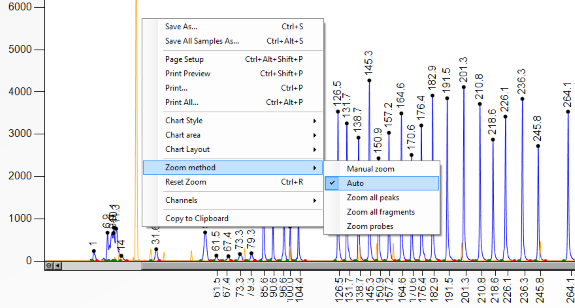 Right-click in the chart and open the Zoom Method menu. Select Set Maximum Y-axis in the ratio chart or Set Maximum Y-value in the chart statistics. 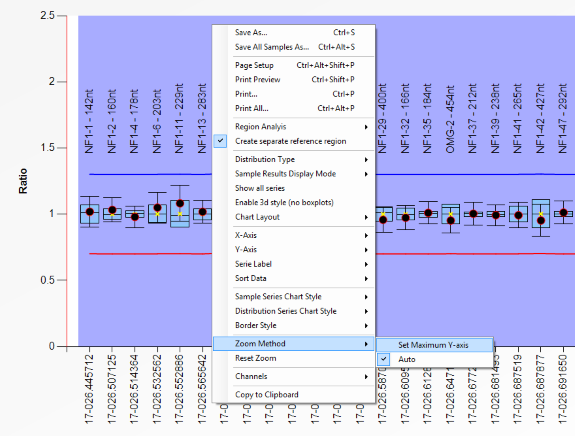 Enter a value in the dialog box and press OK.
To zoom out in the ratio chart of the Comparative Analysis Sample Results Explorer, right-click in the chart and select Reset Zoom. In the chart statistics of the Comparative Analysis Experiment Explorer, right-click and select Zoom Method > No Zoom.